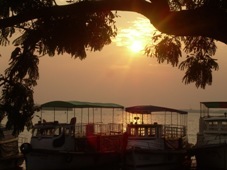 Cochin Attractions are many for a visitor to enjoy this beautiful and vibrant city. Cochin (Kochi) is called as the “Queen of Arabian Sea.” With Arabian Sea on the western side and the Western Ghats on the eastern side, Cochin is also referred as the “Gateway of South India.” It is also the commercial capital of Kerala. Cochin has one of the finest natural harbors in the world. It is also one of the oldest ports in the country and one of the most attractive destinations in the world. Arabs, Chinese, Dutch, British and Portuguese had traded relations with Kochi. Fort Kochi – It is one of the main Cochin Attractions. You can see the rich historical legacy at Fort Kochi which still retains the ambiance of the colonial past. Another Cochin Attraction is the famous Fort Kochi Beach which attracts tourists from all over the world. 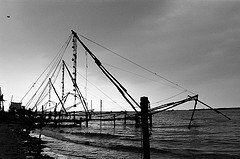 Chinese Fishing Nets – It is believed that these nets were introduced by traders of Court of Chinese rulers during 1350-1450AD in Cochin. They are set up in teak wood and bamboo poles and are mainly used in high tide. Marine Drive - It is a beautiful place to spend an evening for locals as well as the tourists. Get more info here. St. Francis Church – It is believed that this was the first church built by the Europeans in India. The Portuguese built this church in 1503 in wood, and later rebuilt in stone in the 16th century. Vasco Da Gama, the discoverer of sea route to India, during his third visit died here in 1524 and was buried here. Later his remains were taken to Portugal, and the tombstone can still be seen in the Church premises. Santa Cruz Basilica Church – The Portuguese built this historic church, and later it was demolished by British in 1795. A new building was built in that place in 1887, and rich collections of beautiful paintings can be seen here. Jewish Synagogue - This synagogue in Mattancherry was built in 1568 and is the oldest in the country, is another major Cochin attractions. Some of the evidences of the Jewish history such as Hebrew inscriptions on stone slabs and other ancient artifacts can be seen here. You can also see curio shops dealing in antiques as well as rare glass and beads in the township around this synagogue. This township was known for spice trade. Dutch Palace – This Palace was built by the Portuguese and presented to the Raja of Kochi, Veera Kerala Varma in 1555. Later it was taken by the Dutch and renovated, and is known as Dutch Palace. It houses fine murals depicting scenes from Ramayana, Mahabharata and other mythological figures. Also seen are royal costumes, palanquins and other royal memorabilia. It is as also known as Mattancherry Palace. Bolghatty Island – It was built in Koch Bay in 1744 by the Dutch, and now it is a heritage hotel run by the KTDC. It is an attractive picnic spot because of the lush green landscape and the panoramic views of the backwaters. A small golf course and special honeymoon cottages are also in this scenic island. Vypin Island and Light House – It is one of the most densely populated island of the country. The lighthouse located at Ochanthuruth gives a wonderful view of the Kochi City and Aluva Town. You can see a bridge there which connects the northern end of the island to the mainland. Boat services are also available from the mainland to the Island. Willingdon Island – This Island was named after Lord Willingdon, one of the British Viceroys, and is in the mainland. Most of the important offices of Cochin and the finest hotels are located here. Pallippuram Fort - This fort was built by the Portuguese in 1503, and is believed to be the first fort built in India by the Europeans. An important Catholic church is also situated here. Indira Gandhi Boat Race – If you visit Cochin during Onam festival (August-September) you can enjoy the famous snake boat race from the Marine drive promenade. Cochin (Kochi), the gateway to Kerala, is must visit destination for every tourist in the itinery.